Put Some FUN in Your Fundraiser! Let Our Hot Shot Air-Powered Golf Ball Cannon Bang Make Your Outing More Bucks! A Fun New Way to put Ka-BOOM and Cha-CHING into your Golf Outing. Introducing the “Hot Shot Cannons for a Cause” golf ball launcher. Here’s how it works. Our professional staff loads our numbered golf ball into our light-weight, no kick, Hot Shot Cannon air gun. Our staff helps them take aim and the player pulls the trigger launching their golf ball toward a par 4 green, 300 yards away, potentially setting up a putt for eagle. Or turn a long par 4 or par 5 into a par 3! A great way to pick up the pace of play whild making additional money on a hole that traditionally does not produce revenue! A new fundraising opportunity on a par 4 that usually does not raise a dollar! Create a new fundraising contest on a par 4. Golfers pay a fee to fire the Hot Shot Cannon. Once they see it, they just have to try it. Unique sponsorship option. Sponsor signs are great but everyone will remember the sponsor of this hole. You’ll have sponsors lining up for this opportunity. 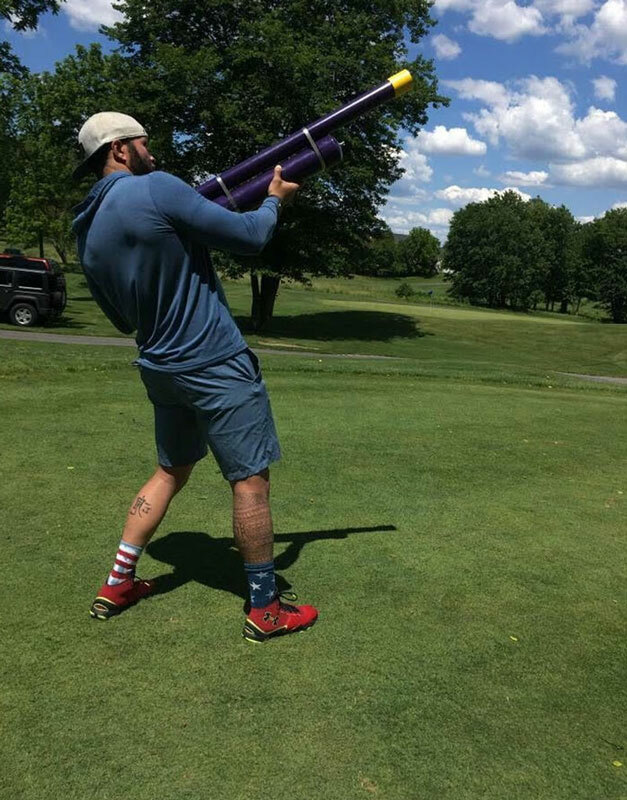 The Hot Shot Cannons are a unique and will be a hit with your golfers! Only a few exist in the country. Pace of play enhancement for the tournament! How does driving a par 4 sound? We think pretty darn good! Safety. The Hot Shot Cannons are safe, extremely light weight with no kick at all. Ease of use. We take care of the Hot Shot Cannons from start to finish. All of our events are fully staffed and insured! A memorable experience for your golfers. Everyone will be taking pictures and video of their Hot Shot Cannon experience, sharing it with their friends and on social media, and talking about it post-round. Affordability. Yep, it’s so affordable we know you will be delighted! The On Course Experience is the exclusive provider of the Hot Shot Cannon in Maryland. "Jeff Mose is a very serious and professional Certified Master Golf Tournament Consultant, who also brings lots of fun, laughter and money to our golf fundraisers!! His super cannon-gun is a total hit! It is light enough for ladies." "Every one of our 130 players were totally thrilled to have the experience of shooting a golf ball over 350 yards in the air for our par 4 Closest to the Pin Contest. Working with Jeff Mose was wonderful. The event was very well organized and Jeff and his team coached all of us how to use the cannon gun and did so with great fun and humor. We are looking forward to having Jeff join us again for our 27th Annual Charity Tournament this year." "The Hot Shot Cannon was a fantastic addition to our charity golf outing! Our golfers loved it and it provided a fun/unique on course experience to our event. I would highly recommend its use in any golf event… I know we will be using it again in this year’s tourney!" "We used the Hot Shot Cannon for our corporate golf event last year and loved it! The Hot Shot Cannon gun leveled the playing field for all in a fun way on the closest to the pin hole. Jeff did a great job of introducing it to each of our players, making the most out of the experience. Looking forward to incorporating it into our event this year." "I wanted to take a moment and thank you for adding such a fun element to our annual company golf tournament. Everyone had so much fun shooting the cannons in lieu of their drive. It definitely added an interesting competitive component amongst the guys. People were talking about it for days and clients thanked us for adding a fun twist to a typical golf outing. In addition, NLP Enterprises is committed to giving back to our community. You helped us raise over $1100 for our designated charity, South County Animal Rescue and Sanctuary. There was not one foursome that declined the $5 per shot/ $20 per foursome donation. In fact, many gave more. Your professionalism, presentation, and energy was just what we needed to add a little excitement to our event. We will definitely use you in the future and will recommend you to our business peers."